SUBHEAD: Film about Peruvian state and corporate interests taking resources that indigenous people protect. 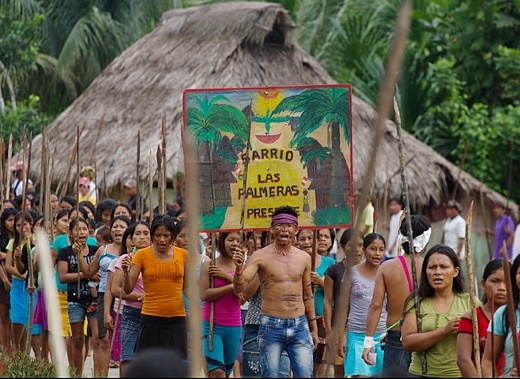 Image above: Still frame from "When Two Worlds Collide" documentary showing Peru's Indigenous Amazonian people protesting to save their rainforest. From original article. As members of the Standing Rock Sioux and other tribes confront the Dakota Access pipeline, don’t miss Heidi Brandenburg and Mathew Orzel’s hard-hitting film about a more violent resistance by Indigenous people south of the border against would-be developers and exploiters. When Two Worlds Collide is an eye-opening documentary about Peru’s Amazonian tribes’ struggle to protect their ancestral homeland in the rainforest against the destruction and deforestation wreaked by oil, logging, and other extractive industries acting in cahoots with the government of President Alan Garcia. Their efforts put Peru’s indigenous peoples on the frontlines of international eco-activism and puts them on a collision course with the iron heel of the state. At the heart of this struggle is the aboriginal tribes’ campaign to rollback laws passed by the federal government in Lima that overturn Indigenous people’s rights to collective ownership of land and water and their resources in favor of exploitation by for-profit private developers. Amazonian activists contend up to 102 laws in Peru are unconstitutional and demand that they be repealed — in particular the despised forestry law, number 1090. Ignored by the legislature, where tricky parliamentary maneuvers are pulled to outfox opposition party representatives and negotiations lead to a road going nowhere, Native freedom fighters resort to roadblocks, occupations, and other civil disobedience tactics. At the vortex of this mass movement is Alberto Pizango, a Peruvian Indian who attended university, became a teacher and then leader of Native rights’ groups, including the Interethnic Association for the Development of the Peruvian Rainforest (AIDESEP). As the film’s protagonist Pizango makes a compelling character study. In some ways Collide harkens back to the early Soviet revolutionary cinema of VI Pudovkin, that depicted the dynamic interplay between individuals and causes, as in Pudovkin’s 1928 Storm Over Asia (which also dealt with Native people fighting outsiders). The Amazonian cauldron boils over in June 2009 when militarized Special Forces Police wearing helmets (look for cinematic metallic reflections) and camouflage uniforms, riding in armored vehicles and choppers, clash with demonstrators. All hell breaks loose as protesters are shot and policemen killed (some by spears). Perhaps in retaliation, at a Petroperú (the state-owned petroleum company) pumping station, up to 38 outnumbered law enforcers are taken hostage and then executed. Presumably Bandenburg and Orzel had access to TV footage of the pitched battles, although during these volatile sequences the press is seen being sidelined by the powers-that-be. Pizango, in turn, holds el presidente responsible for sending armed riot police into the rainforest-turned-tinderbox. After the government throws the book at him, Pizango goes on the lam. In one scene straight out of Victor Hugo’s Les Miserables, like Jean Valjean, the fugitive from justice scampers over rooftops in Lima, where the Nicaraguan embassy grants him political asylum. Granted safe passage, Pizango flees to the Nicaraguan capital of Managua in July 2009 where he lives in exile — but will he stay there or return to face the music? To paraphrase its title, this documentary shows what happens when two worldviews collide, and to its credit, the film shows both sides of the story — although there’s no doubt which side the filmmakers are on. On the other hand, Pizango explains Indigenous philosophy, wherein humans are one with nature — like Adam and Eve before they bit the apple from the tree of knowledge that led, so to speak, to Eden’s over-development. For his part, Pizango declares: “the accumulation of money and wealth, we call that kind of development ‘savage’… You kill the rainforest, you kill a culture. You kill an entire people.” Natives, he says, support development that’s sustainable and doesn’t destroy Mother Nature and their livelihood, and don’t endorse violence. Orzel’s and Brandenburg’s “concerto” is exceptionally well-made, with exquisite close-ups of rainforest flora and fauna intercut with devastating oil spills and chainsaws slicing through trees. The 103-minute subtitled documentary, which is, curiously, co-presented by the Ford Foundation, covers lots of ground but arguably misses making a few points. Although the Amazon forest is widely hailed as “the lungs of the world,” Collide doesn’t expand its concerns to include global warming, as Josh Fox does in his climate change documentary How to Let Go of the World which depicts Pacific Islanders battling coal ships, etc. Nor does it point out that Peru is a conservative holdout, one of the few South American nations that didn’t join the so-called “Bolivarian Revolution” that swept left-leaning, Indigenous presidents such as Evo Morales in Bolivia and the late Hugo Chavez in Venezuela to power. Despite these omissions, Collide, which bagged the World Cinema documentary competition prize for best first feature at Sundance, remains a must-see motion picture about the courageous struggle of the Peru’s Indigenous people against the despoliation of their homeland. Video above: Official trailer for "When Worlds Collide. From (https://vimeo.com/178043275). When Two Worlds Collide will be theatrically released in Los Angeles today at the Laemmle Monica Film Center and is coming soon to a theater near you.